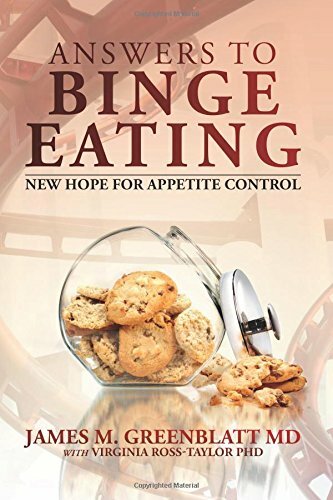 Answers to Binge Eating: New Hope for Appetite Control is not another diet book. The book, written by a leading psychiatrist and eating disorder expert, takes a biological approach versus a behavioral tactic to weight loss and health restoration. It is the first book about overcoming disordered eating that addresses the biological switches that control appetite while offering simple medical and non-medical solutions that will make a positive difference in both physical and emotional health. Readers can use Answers to Binge Eating as either a self-help book or an adjunct to professional treatment. Every year an estimated seventy-two million Americans diet, financing a weight-loss industry worth approximately fifty-five billion dollars. Despite the vast efforts put into weight loss, two-thirds of American adults remain either obese or overweight. Clearly dieting doesn’t work, and failed attempts to lose weight encourage the development of disordered eating behavior. Many of those struggling with a disordered appetite compare it to being trapped on a roller-coaster ride. The feeling of the roller-coaster ride of restricting, bingeing, and chronic self-blame is never ending. There is the stretch of time when the car inches upward, when you feel a sense of progress. Then, without warning, you spiral downward in a great rush, having lost all sense of control. You crave, you eat, you binge. That momentary sense of calm and peace is once again shadowed by shame and guilt. In Answers to Appetite Control, respected psychiatrist and eating disorder expert Dr. James Greenblatt explains how appetite is controlled by the brain’s neurochemical systems, which rely on specific proteins for optimal functioning. The New Hope model described in this book combines the best in traditional and complementary approaches for recovery from appetite disturbances, food addiction, and binge eating. While dieting providers a temporary fix, this book will offer a permanent solution based on scientific research to help you reclaim a healthy appetite with food. Following the New Hope model, you will find your answers to appetite control and get off the roller-coaster ride of food addiction.